Yesterday was the start of getting the motorcycle in shape for the riding season. Top on the list was replacing the dry-rotted tires with new ones. I briefly tried prying the old tire off, then realized I was going to scratch the hell out of the rim getting a junk tire off. So out came the angle grinder and I made some smoke. 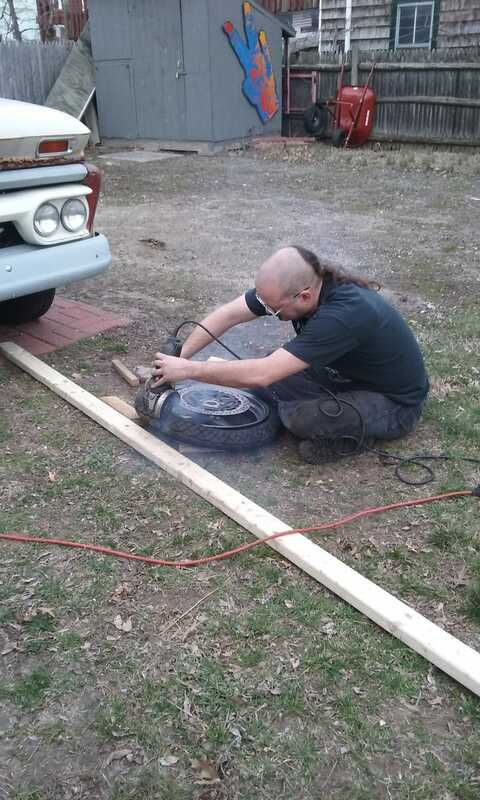 You can’t see it well in the pics, but there is a pry bar keeping the tire up off the rim while I’m cutting. I’m a hack, but not a dangerous hack. Of course it isn’t a proper burnout until you get down to the steel belts. New tires were installed using the “zip-ties & swearing” method. I also bled the brakes. I think the front fluid(left container) might be vintage 1996.